Falling Star Ranch Academy of Foundational Horsemanship now offers a beautiful indoor riding arena (built in 2013). The size is 60′ x 120′ and the footage is sand on a hard-packed clay base. Haul-ins welcome. Arena rentals available. Please contact us for more information by calling 1-250-968-6801 or by email. Falling Star Ranch Academy of Foundational Horsemanship offers an outdoor riding arena (65′ x 140′) with a breathtaking view of the Rockies and Cariboo Mountains. The footage is sand on a hard-packed clay base. We also have a 50′ diameter outdoor round pen. The footage is sand on a hard-packed clay base. Barn with feed area, hay loft, one regular box stall and one large/foaling stall. Box stalls can be used for grooming and tacking up. Our small, but well-organized tack room is available to our boarders as well. Falling Star Ranch Academy of Foundational Horsemanship has several corrals and paddocks to board horses in training, boarders, as well as Falling Star Ranch Academy of Foundational Horsemanship’s own horses. All corrals and paddocks offer shelters and have safe fencing (wood and electric fence). Falling Star Ranch Academy of Foundational Horsemanship has several large pastures for the ranch-owned herd to enjoy their freedom and for youngsters to grow strong on mountain pasture grass. There are also a few smaller pastures for outside training horses and boarders. At Falling Star Ranch Academy of Foundational Horsemanship we feed excellent quality hay produced on the farm or on a neighbouring farm, supplemented by free-choice salt and minerals. Horses in training live outdoors in paddocks, either individually or in groups of two to four horses, with individualized feeding programs and blanketing according to weather conditions. In the summer time, putting on fly masks and applying fly spray are part of the daily routine. Blankets, fly masks and fly sprays to be provided by the horses’ owners. Falling Star Ranch Academy of Foundational Horsemanship offers a limited number of boarding spots. Please inquire to see if we have any openings. Boarding fees are $300 per month and include pasture/grass hay, free-choice salt and minerals, and access to clean water (heated in the winter time). We will feed grain/supplements if supplied by owner. 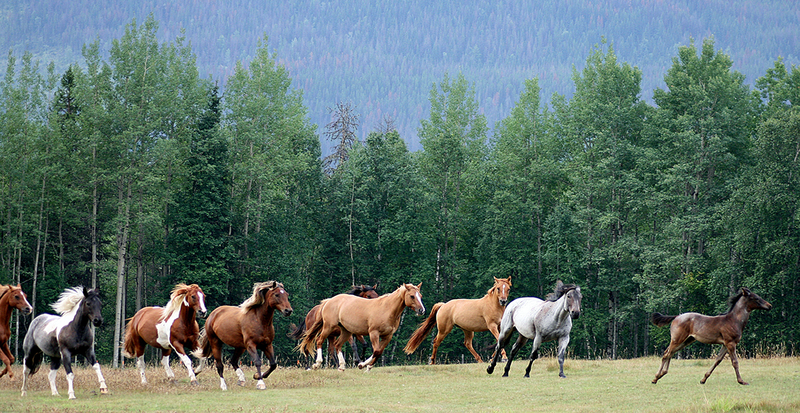 Horses are kept in small groups in paddocks with seasonal pasture turnout. Paddocks are cleaned at least once per day. Horses are checked at least three times a day (including night check). Board includes unlimited use of round pen, outdoor riding arena and indoor riding arena, blanketing if needed, putting on/taking off fly masks, and fly spraying (owner to provide blanket(s), fly mask and fly spray). Owner Birgit Stutz lives on site and is a certified and fully insured trainer/riding instructor. Lessons and training are available on site by certified and fully insured coach and trainer. Vet and farrier are close-by. Farrier and vet call/handling are available at $15/half hour or $30/hour. Full care, excellent feed, and attention. Horses need to have a current negative Coggins-test, be up-to-date on vaccinations (5-way), and be on a regular deworming program. We care for your horse as if it was one of ours.